XYZ Printing showed what appeared to be a real mini 3D printer at CES in January. We requested that new 3D printer for our Battle of the Minis 3D printer review. The new mini 3D printer is not available for review yet, so the display at CES was a very early preview of a product that is not commercially available. So XYZ sent us their daVinci Jr. 3D printer. At first glance this 3D printer does not appear to be a mini 3D printer at all. However, the build plate is definitely small, in the same class as many of the mini 3D printers we have been and are continuing to review. So for that reason alone we are comfortable classifying this 3D printer as one of the many Mini 3D printers available on the market today. This 3D printer is very well packed, but the consequence of such good packaging is a very large box. While a large box is not ideal, especially for shipping or getting it in the door of your house or business, you can have peace of mind that this printer will survive any physical wear and tear the shipping companies can throw at it. There are very large molded Styrofoam protectors surrounding the 3D printer, and many more foam and cardboard inserts protecting the inside parts from moving in transit. There is a full color manual included that walks you through the set up of this 3D printer. After removing all of the packing materials, you need to install the white Bowden tube between the filament feed and the extruder, and load filament. The filament spool is contained inside the 3D printer housing, which is one major reason why the overall 3D printer is so large. The other reason why this 3D printer is so large is the fact that the build plate moves forward and back as it prints. Here is a video of my daVinci Jr. 3D printer unboxing experience. The build plate comes calibrated from the factory, and the packaging materials did a great job maintaining the calibration settings in transit. The completion of the hardware setup consists of installing the power and USB cords, and loading the filament. The power and USB cords are obvious, but the filament loading requires some specific instruction. The daVinci Jr. has a proprietary filament feed system that not only requires a special size spool, but uses a sensor chip that ships with each spool of filament. If the printer does not detect the sensor chip it will not work. This is one of the facts of the daVinci Jr. 3D printer that I do not like at all. Requiring a proprietary filament to maintain the warranty is one thing, but this system also adds so many steps to the process of loading and unloading filament that it is not user friendly. There is a separate filament hub that contains the sensor chip, and in order to change the sensor chip you must remove the hub from the filament spool by removing a screw and separating the hub into two pieces. Then the new sensor chip is inserted in the hub, which must be installed on the new spool of filament to be used. Despite the annoying sensor chip, once it is in place, loading the filament into the machine is very easy. 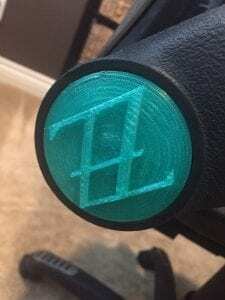 There are graphics and simple instructions to follow, a soring loaded trigger to pull, feed the end of filament into the proper hole, and release the trigger. Then you use the onboard screen menu to tell the machine to load the filament, then it proceeds to heat the extruder and feeds the filament. Once the filament is extruding the printer is ready to print. The exterior design of the daVinci Jr. 3D printer is very impressive, especially for a $399 printer. It is a fully enclosed design with translucent plastic side panels and a large clear window in the front. The front panel lifts up with hinges and stays in an upper location when needed. There are bright LED lights to illuminate the inside of the 3D printer. I discovered that the lights do not stay on for the duration of a print with the default settings. I had to go into the energy saver settings on the 3D printer’s LCD display, and change them to never turn the lights off in order to have enough light for my time lapse video. Before you can make your first print you need to download and setup the XYZWare software on your computer. This process was as easy as it should be, maybe even easier than most. 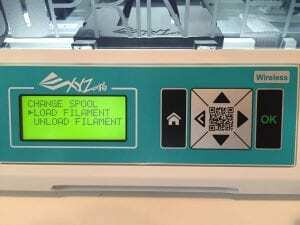 XYZ Printing ships an SD card with the 3D Printer that contains the XYZWare software . I just inserted the SD card into the SD slot on my computer, and ran the setup program. When I started the software it immediately went online and checked for an update, I agreed to download and install it so I had the latest version available. 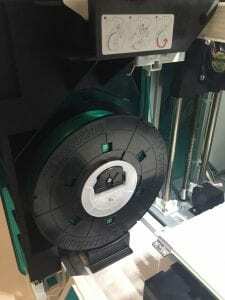 After the updated software was installed, it found the daVinci Jr. and detected that the firmware on the 3D printer needed to be upgraded. I agreed to allow it to download and install the latest firmware, which was a very fast and simple process. Well done XYZ! Now I was ready to load and prepare my first print. This process was easy to import an STL file, choose the print settings, and send it to the printer. I had success printing the very first print I sent, and all subsequent prints. The first print was of our collapsible coffee sleeve, and it printed perfectly. I elected to print it with a raft because there are some small points of contact with the build plate. I was surprised about the way the XYZWare software creates rafts, as they are much different from all other rafts I have experienced. Most slicing software creates a raft that is in the same shape as the pat being printed. So in the case of the coffee sleeve model, the raft is usually a donut shape, round around the outside with a hole in the center. However, the XYZWare made a raft that was a complete square that was slightly larger than the part being printed. This struck me as a waste of plastic, and a waste of time printing more raft surface area than was actually needed. I also noticed that the raft was thinner than others. When the print was complete I was able to easily remove the print and raft from the build plate with a spatula, but removing the raft was a different story. This raft is impossible to remove! It really surprised me how difficult it was to remove the raft from the printed part. In fact, I found it extremely difficult, and practically impossible to remove the raft. The raft was fused to the part so significantly that I was stretching the plastic and breaking it at the edges of the good part, but the raft was still fused to the bottom of the good parts. My experience with rafts from other slicing software is that they are thicker, and easily crack and pull away from the good part when pried apart. 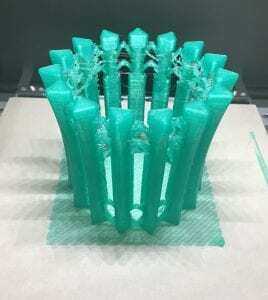 There is usually what is called an “air gap layer”, or a little extra vertical distance programmed in between the raft and the first layer of the part to be printed. It appears that XYZWare does not include the air gap layer in their slicing code. I tried this on several other parts as well, with similar results. I always start new 3D printer test prints with rafts because often 3D printers have trouble with the first layer sticking to the build plate, and a raft will usually cure those problems. So I continued by reprinting the models I already printed, but this time without rafts. I am happy to report that the daVinci Jr. did a great job printing parts without rafts. I know there will be some delicate parts that absolutely need a raft in order to get very small objects to stick to the build plate. Unfortunately, the XYZWare is not an ideal software for that kind of print. I checked with Simplify3D to see if they had a profile for this 3D printer, so I could use their slicing software and test their raft. I was informed that there is no Simplify3D profile for the daVinci Jr. so I am out of luck for trying a different raft on this 3D printer. I did encounter one minor glitch in the system that I need to report. After I sent one print, and tried to send a subsequent print, the XYZWare would tell me that the printer was busy. The only way I could figure out how to fix this problem was to turn off the printer, and the power it up again. So after each complete print, I had to go through this process so the next print could be sent to the printer. Below is a time lapse of our 3D Printed Collapsible Coffee Sleeve created by Eduardo Martini, a long time WTFFF?! listener from Brazil. It is not printed on the XYZ daVinci Jr. but it shows the printing process of one of the same models we did print on the daVinci Jr. He accidentally printed it with some support, it is designed to be printed without supports, but that is ok, it is still a cool video! Thank you Eduardo! For only $399, this is the most robust mini 3D printer we have tested so far. It certainly is a very impressive design, its appearance is more professional than many full size 3D printers on the market. Despite the raft problems, it was easy to set up and use. 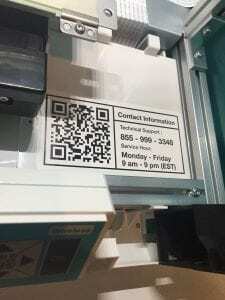 I like how XYZ puts their contact information in a very obvious place in the 3D printer, you can’t miss it! The quality of the printed parts was exactly what they should be. It just worked, and worked well, I am impressed. hello guys! just uploaded the video of my timelapse of the coffee sleeve printing!!! sadly i forgot to disable the automatic support!! and it got stuck! and broke one of the pieces! but great design and beautifull timelapse printing video!!! Hey Eduardo! Thanks so much for sharing your video! 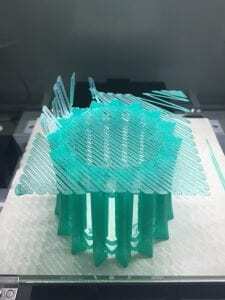 It is great to see you printing our model. 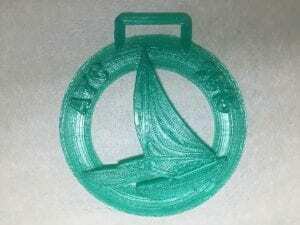 You were the first to get this one, but we will be releasing it to others over Thingiverse soon. We have added your video in the blog post above! Best regards!